The archipelago of Madeira is situated in the Atlantic Ocean 535 miles southwest of Lisbon and 490 miles off the coast of Morocco in Africa. Madeira consists of 3 main islands, of which two are inhabited. These are Madeira Island and Porto Santo with the other island being appropriately named Ilhas Desertas (deserted island). The population of the islands is around 250,000 with around 4,800 living on Porto Santo and the rest on Madeira Island. The chain of volcanic islands are a sup-tropical oasis of steep verdant cliffs rising out of the blue ocean. Along the centre of Madeira Island mountains rise to around 4000 feet (1220 metres) dropping straight into ravines which radiate out to the coast. Dense vegetation grows on terraces clinging to the mountainsides, with white houses dotted around. The island was originally covered in a laurisilva forest. In fact the name Madeira means wood in Portuguese. However, the 15th century settlers soon cleared much of these trees to make way for farming land and created the terraced hillsides that are still present. 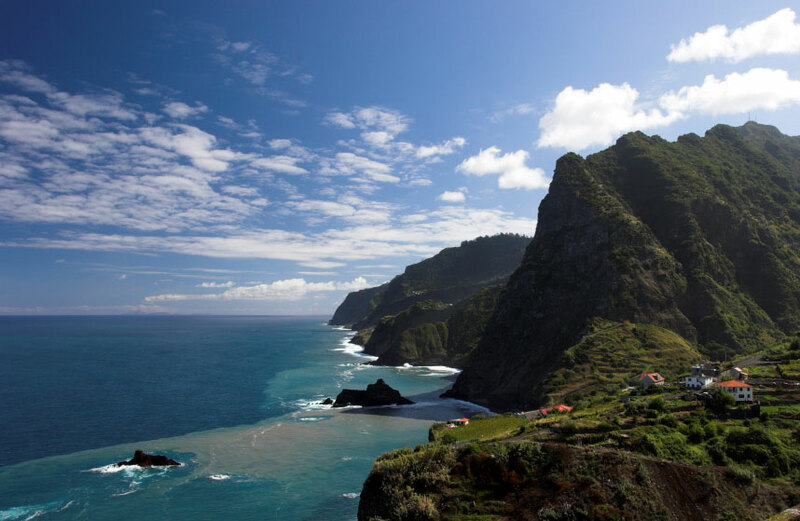 Madeira’s geographical position and mountainous landscape create a very civil climate. Temperatures range from about 16 °C (61 °F) during the winter and about 22 °C (72 °F) in the summer. The islands are also in the Gulf Stream, which means the sea water temperature remains more or less the same as the air temperature. The islands were discovered uninhabited by the Portuguese explorer João Gonçalves Zarco in 1418. Not long after, Prince Henry the Navigator began the colonization of the islands and established sugar plantations. These plantations became the prototype for the plantation system developed for the Portuguese colonies in Brazil after 1550. The economic importance of Madeira wine had surpassed that of sugar by the late 17th century. A British colony of merchants and businessmen established themselves on Madeira around that time, and eventually came to dominate the islands' linen, wine, banking, export, and tourism industries. The capital city of the Islands is Funchal. It is located on the southern side of the island in Funchal bay and has a population of around 150,000. Sometimes referred to as the ‘Pearl of the Ocean’ or ‘Jewel of the Atlantic’ Funchal is built in a natural amphitheatre which descends to the harbour from almost 1200 metres high on gentle slopes. The name of the city is derived from the abundance of the fennel herb – the Portuguese for which is funcho. As the islands capital for over 5 centuries there are plenty of historic sites to see in Funchal. This includes the remains of 16th and 17th century forts of Pico and São Tiago. Located more or less in the centre of the city is the 15th century Cathedral of Santa Clara, with its Manueline pulpit and the tomb of João Gonçalves Zarco. It was built by Gil Eanes between 1493 and 1514. There are also numerous fine houses and gardens including the Botanical Gardens, Palheiro Gardens and the Boa Vista Orchid Garden. The sub-tropical climate means that many examples of exotic plants exist. For example Asian orchids, hydrangeas, bougainvillaea, magnolias and azaleas thrive, with fruit such as mangos and papayas growing too. Madeira is perhaps best known for the Madeira dessert wine. The wine is made by a process of hastening the maturation which involves subjecting the casks to high temperatures (up to 60°C). This in theory duplicates the effect of a long sea voyage. The shelf life of the wine is extended by fortifying using grape spirits which originally increased its ability to survive long voyages. In Funchal today you can visit the Madeira wine lodges and sample the wine. Perhaps the best known of these is Blandy's, situated in the centre of Funchal in a 17th century Franciscan monastery. As a by-product of the island’s irrigation system there is some excellent hiking in Madeira. The system of levadas (Portuguese for "led") were built between the 16th and 19th centuries to carry water from the wet northwest to the dry southeast. There are over 1350 miles of these irrigation channels providing a network of walking paths ranging from relaxing walks to perilous crumbling cliff ledges. As well as providing a hiking network the levadas now not only supply water to the southern parts of the island but provide hydro-electric power.